I am a Federation of Genealogical Societies (FGS) Ambassador. 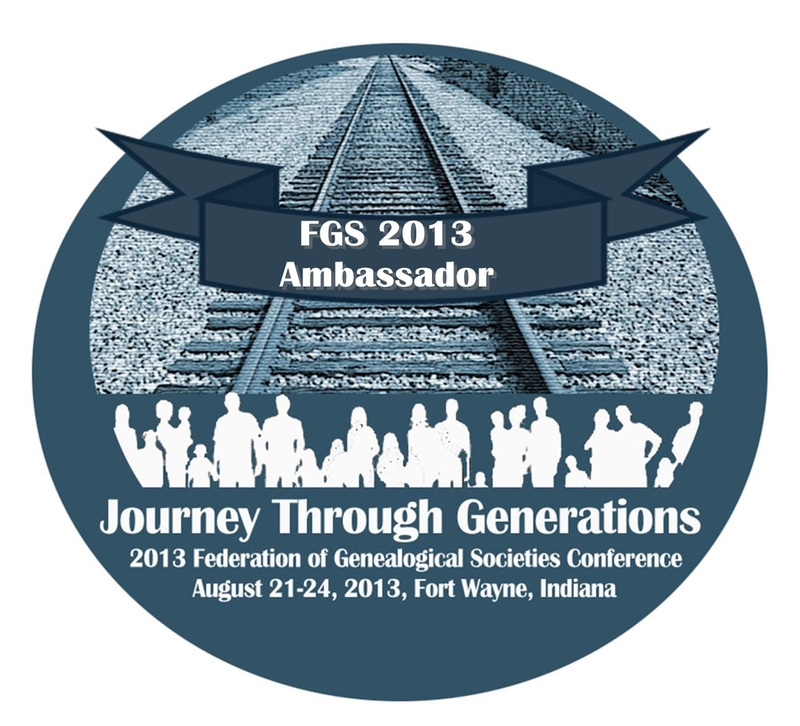 My role as an ambassador is to help promote the FGS 2013 conference through blogging and other social media platforms. The publicity committee provided a few writing prompt questions to answer which you will find below. Why are you coming to FGS 2013? My first FGS conference attendance was in 2011 in Springfield, Illinois. It was at that conference that I learned that the 2013 conference would be held in Fort Wayne, Indiana, about 100 miles from my home in Battle Creek, Michigan. It is just a quick jaunt down Interstate 69. A national genealogy conference within a hour and a half from me, why wouldn't I go? The opportunity to become totally immersed in all things genealogy is the number one reason for going. The informative sessions provide me with enough information to further my current research. Plus, spending days with other people who share my passion for genealogy is so much fun. What are your favorite parts about genealogy conferences? Raindrops on roses and whiskers on kittens-oh, wait those are favorite things, not favorite parts. You may see raindrops on roses if you attend the opening social at the botanical conservatory. The social events are a great part of the time spent at a conference. It is a time to meet new people who share your love of genealogy. Another favorite part of conference going is the exhibit hall. It is the place to learn about the latest and greatest products in genealogy. Have a question about your genealogy software or curious about a new product? The exhibit hall is the place to get answers. All things genealogy can be found here. I even scheduled a visit to the exhibit hall in place of a session it was so wonderful. What better way to spend an hour or two than by combining shopping AND genealogy! The variety of genealogical education opportunities is my favorite part. Believe me, you will have trouble narrowing your selection down as the choices are all great. Don't worry though, you will be given the syllabus for all sessions and you can order copies of the sessions to watch when you get home. Truly, there is something for everyone. You will find research topics on African American, British Isles, European, Genetics, German, How To and Methodologies, Midwest Research and Repositories, Migration and Immigration, Military, Online Resources, Technology, Transportation, Writing and more. In depth education is offered through workshops on topics like German Gothic Handwriting, BCG Certification, Images, Griffiths Valuation, Midwestern American Indians, and African American Research in University Libraries. What are you most looking forward to at FGS 2013? 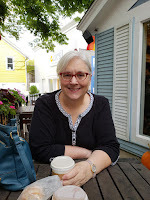 There are so many things to look forward to when going to a national genealogy conference it is hard to pick just one. I could pick the opportunity to research, in addition, to going to the conference, but I go to Allen County Public Library about three times a year. I could pick the learning opportunities presented by great speakers. I could pick the genealogy shopping experience at the exhibit hall or the swag. The freebies are always fun. But, for me, the people are what makes going to the conference something to look forward to. The thing I am most looking forward to is meeting and learning from other genealogists. I was sitting in a session on Mennonite research in Springfield and a woman behind me was from the area in Pennsylvania that my ancestors lived. She gave me research ideas that enabled me to find more records. Why should genealogists attend conferences? Whether you are a recreational or hobby-type genealogist, like me, or a professional genealogist with years of experience, there is something for everyone at a conference. Attending a conference is the best way to educate yourself about genealogy trends and topics. You will see the latest gadgets, books, software, and more at the conference. You will be in genealogy information overload by the time the conference is over. You will go home and be excited to pick up where you left off in your research. If you are lucky, you will break through that brickwall by learning that one piece of information you needed to do so. Plus, you might meet the author of your favorite blog or book, that friend on Facebook or Twitter, or someone who's work you have admired. You will make new friends and have the time of your genealogical life. Now that I have shown you how great it is to attend a FGS Conference, plan to attend one.